In the last month, we've been hearing more and more warnings about the dangers of antibiotic resistance in bacteria. The UK's Chief Medical Officer Dame Sally Davies even warned that within 20 years, people could be dying from routine surgery as a result. But this week, a paper in PLoS ONE revealed how a substance found in human breast milk can make antibiotic resistant strains sensitive to those drugs once again. To find out more we were joined by Anders Hakansson from the university at Buffalo at the State University of New York. Chris - So, tell us first of all, what is this protein that you've discovered? What is it doing and where is it? Anders - Well, so the protein we've discovered is present in human breast milk and it's essentially a complex between alpha lactalbumin which is the most common protein in human milk, and when it attaches itself to a fatty acid which is also prevalent in human milk called oleic acid. A complex is made that has this activity that it can sensitise at the microbial resistant strains of bacteria out to the antibiotics that they are resistant to. Chris - So, in some way, it renders bugs that can normally grow with impunity in the presence of an antibiotic compound sensitive again. How is it doing that? Anders - Well, so what we know at this point is that we know that our protein is acting directly on the membrane. It binds to a pump that normally excretes hydrogen ions and all cells - both our cells in the body and bacteria have a tendency to keep different concentrations of ions on either side of the membrane. And by attacking this pump, suddenly, the concentrations cannot be kept up differently on each side. And when that happens, suddenly all the other ion concentrations are kind of messed up, and we get calcium and other types of ions coming into the cell that suddenly destabilises the bacteria to the degree that suddenly now, antibiotics can reach their target much more effectively. Chris - Because if you take penicillin for example, a lot of bacteria that are resistant to that make an enzyme that binds the penicillin molecule and stops it working. So, how would this process re-sensitise bugs to penicillin? Anders - That is a good question. So, what we have done at this point is, we have looked at methicillin-resistant and also actually, penicillin-resistant bacteria, but most of the bacteria we've looked at are more penicillin-resistant based on their ability to change their penicillin-binding protein from the outside rather than the enzymatic activity. But the bacteria that do have the enzyme, what seems to be happening when we add our hamlet protein is that messing around with the ion concentrations renders the bacteria, enables to make energy. And most of these enzymes requires energy to act properly. And the other thing that seems to be happening is that the cell wall structures are changing to the degree that antibiotics have an easier way to get access to them even though there are enzymes around that can cleave the penicillins. Chris - So, would these effects be active against a broad class of bacteria or will it only work against some bacteria? Anders - So, at this point, we have quite good evidence that it will work against a number of different species of bacteria. So, the paper that has just published was talking mostly about methicillin-resistant staphylococcus aureus. With this, we wanted to make a case with the bacterium that is a big clinical problem. But we've also tested E. coli and a number of both gram positive and gram negative bacterium that are kind of common in clinical situations and where antibiotic resistance is a big problem, and it seems to be working on all of those. Chris - Which is very good news. So, how would you see this actually being deployed? It's a protein, so you couldn't just swallow this as a pill. Anders - No, that's right. So, if we were to swallow it, it would probably be - it's not really degraded very well, but it's not absorbed very well from the gut. So, the way I foresee it at this point is that - what we're pursuing at the moment is mostly topical applications. So, with Staphylococci, we have wound infections and we have pneumonia where we can do inhalation rather than eating a pill. 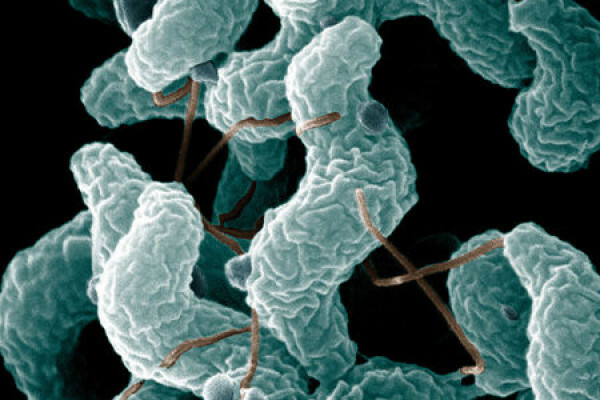 We could go into vancomycin-resistant enterococci or clostridia which also are gastrointestinal infections and in that case, you can actually eat the protein together with the antibiotics and give an effect on the mucosal surface because this is not inside the body in the bloodstream. Chris - Is it safe and well-tolerated? Anders - Yes, as a human breast milk protein that infants are drinking it daily and we have tested this at very high concentrations, both in animal models as well as in humans actually, and we don't see any side effects whatsoever. Chris - So, is there not a way of making the human body make its own hamlet protein so that you don't have to give it? You could just turn on the ability of the body to make it itself. Anders - Well, the only problem is that this is only produced during lactation. So, it's only produced in human milk. So, there's no other cells that are actually producing it. So, you have to - the other option will be to drink breast milk rather than making synthetic protein. And that might actually work well as well.